…In 1854 we find that Arcata had about fourteen stores carrying large stocks of goods, besides saddle and harnessmakers, jewelers, gunsmiths, tin- smiths, and several blacksmith and wagon shops, all of which did an active and profitable business. It seems that the first active officers of Arcata were elected in April, 1856, under the order of county judge, incorporating the village. 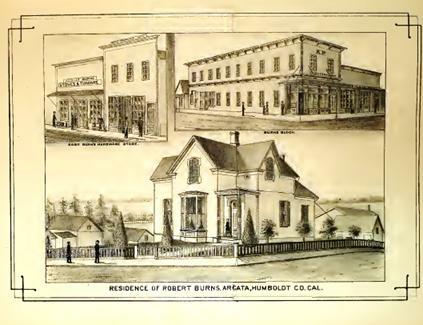 There were four towns on the bay in 1855 — Humboldt, Bucksport, Eureka, and Union. The first three boasted of a store each, while the latter had seven large wholesale establishments, with harnessmakers, saddlers, etc., as indicated. You are currently browsing the Lynette's NorCal History Blog blog archives for February, 2017.